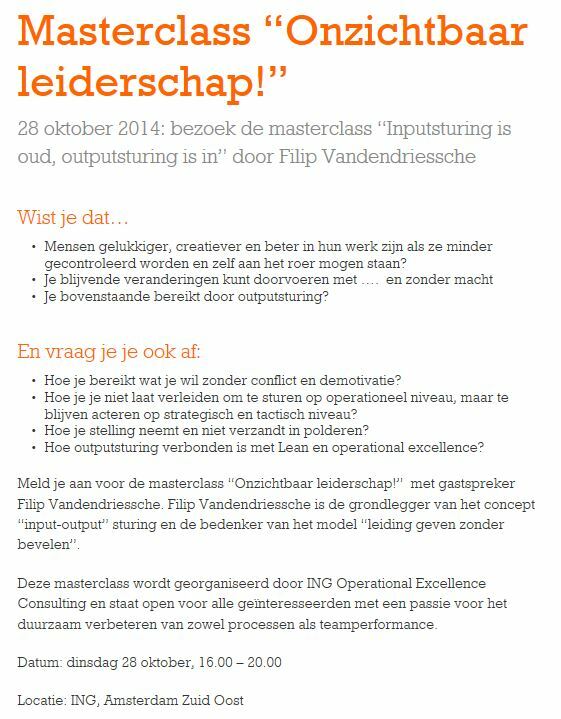 ING organizes a free master class (in Dutch) on Output Steering by Filip Vandendriessche. This is a unique opportunity that you don’t want to miss out on! Out with input-steering, in with output-steering: Dutch bank ING organizes a master class Output Management (in Dutch) on October 28th, 2014. No other than Filip Vandendriessche himself – the Belgian Output-steering guru – will explain the ins and outs of output steering and Invisible Leadership. This is an excellent opportunity for anyone who’s interested in ouput steering. I have attended one of his master classes before, and in my experience Mr. Vandendriessche is both an excellent speaker and an inspirational trainer. As you can read in many of my posts (for example link, link, link or link), I strongly believe in Output Steering. Moreover, it is an essential part of Super7 Operations. This entry was posted in Operational Management and tagged Filip Vandendriessche, operational excellence, operational management on September 24, 2014 by M.R. van Dijk. Managing autonomous teams, or Super7 teams, requires a different management style than managing regular teams. Here’s the last part the key do’s and don’ts from my practice as a Lean Super7 consultant. And, in my opinion, this one is the most important. Perhaps most importantly, Do: Use your own strengths and talents. Don’t: Put all your efforts on improving your weaknesses. The best advice I can give any manager is: be the best person that you can be. Use your talents as much as you can. If you only focus on improving your weaknesses, you won’t be able to perform at your best. You will be most effective when you do the things you like to do and use your own unique talents while doing them. When faced with a transition from a more traditional organization towards autonomous teams or Super7’s, you might at first only see those elements that are difficult for you, that you don’t like and where you can’t use your talents. But if you give it a chance, if you start experimenting, you might find that there is a way to use your strengths in the new way of working. In my experience, most managers will find a way that fits them. Of course, managing autonomous teams or Super7’s will not be the perfect job for everybody. It is important for your happiness and for your chances to success that you keep searching for an environment where you can do the things you like and use your talents at the same time. And in some cases, this may mean a change of career. But, there isn’t just one way or one perfect style of managing autonomous teams. Take a chance, experiment, and you might just find the style that works for you and for your teams. This entry was posted in Lean, Operational Management, Teamwork & cooperative models and tagged Book on Super7, operational excellence, Super Seven, Super7 Operations, Teams, Teamwork on September 20, 2014 by M.R. van Dijk. Managing autonomous teams, or Super7 teams, requires a different management style than managing regular teams. Here’s part four of the key do’s and don’ts from my practice as a Lean Super7 consultant. This week, we’ll look into the competences that an output-manager needs. When your department introduces Super7 Operations, or other forms of autonomous teams, this may help you to adapt to the new situation you’ll face as a manager. Other skills and behaviors are asked from a manager when an organization makes the transition from a classical, input steered organization towards autonomous teams or Super7’s. This entry was posted in Lean, Operational Management, Teamwork & cooperative models and tagged continuous improvement, Lean, learning organisation, operational excellence, Super Seven, Super7, Super7 Operations, Teams, Teamwork on September 17, 2014 by M.R. van Dijk. Managing autonomous teams, or Super7 teams, requires a different management style than managing regular teams. Here’s part three of the key do’s and don’ts from my practice as a Lean Super7 consultant. This week, we’ll discuss the do’s and don’ts of management metrics and dashboards for autonomous teams. When your department introduces Super7 Operations, or other forms of autonomous teams, this may help you to adapt to the new situation you’ll face as a manager. Many managers in Financial Services Operations are used to manage by spreadsheet. When switching to output steering, they might tend to overcompensate. Instead of managing productivity, Fisrt-Time-Right and throughput time, they just evaluate whether the output has been delivered or not. The outcome is black or white, good or bad: either the team made it, or they didn’t. Managers should use quantitative metrics to measure the output. When the target output hasn’t been met, the team should be able to see by exactly how much the target was missed. This allows learning and evaluation of improvement experiments. Don’t: Use these Lean steering metrics to manage the team on a daily basis. As said, many managers in Financial Services Operations are used to manage by spreadsheet. These spreadsheets may still be of value for autonomous teams or Super7’s. However, the teams should only be managed on their performance against the daily output target. All other metrics should be used to aid in the team’s continuous improvement efforts. Dashboards and spreadsheets give valuable insight in where the autonomous team or Super7 can improve. This entry was posted in Lean, Operational Management, Teamwork & cooperative models and tagged Book on Super7, continuous improvement, operational excellence, Super Seven, Super7, Super7 Operations, Teams, Teamwork on September 12, 2014 by M.R. van Dijk.